Flavor Text: I have no fear, not even from the prophecies of the madman Klenze. lol this guy seems really mean. Danigral - 3 out of 5. He’s a bit expensive. While not as strong as Grete, he also is a great card for Twilight Gate and Shocking Transformation, better than just running him in mono-Agency. Again, a card that rewards a defensive strategy with some tricks. mnBroncos - 4 out of 5. Very strong card but at 5 cost will probably only see play in the Lt. Wilson deck. Now in that deck he is a big threat that may come out as early as your third turn and if that happen he can completely destroy your opponents resources. (also note that it isn’t for results of a combat struggle where he is committed). Obtuse - 3 out of 5. I want to like this guy a little more and I may be rating him a little light. I don’t often see combat struggles result in wounds in my games unless someone makes an error, gets tricked, or is desperate. It does happen though and this guy is definitely playable with the LT.
Kamacausey - 2 out of 5. I may be wrong here but I'm not a big fan of this guy. I feel like he is overcosted for what you're getting. Yes he has the potential to have a threatening ability but players will mitigate that by not going go stories if they are going to lose at the story in the first place. He is definitely a character you have to build your deck around. livingend - 2 out of 5. Obtuse hit the nail on the head here. Characters just don’t get destroyed in combat struggles incredibly often under normal circumstances. You basically have to cheat him into play after your opponent has committed to stories to have a decent shot at triggering his ability. And then there’s still the terror problem… Verdict: I’d rather run Torch the Joint for a similar effect. WWDrakey & Ire - 3 out of 5. Let's face it, the ability will not happen all that much, except maybe as a fun Shocking Transformation trick. Still, how could you give a smaller rating for a cool submarine captain? Especially as, the ability, when it does happen, is kinda painful. This website shows Karl's subtype as Hunter rather than Government. Also, this guy seems pretty weak to me. I think he's costed right, but I think he needed to be beefed up a little bit more - either with icons or more abilities - to make him playable. It would have been cool if they would have added something like "Action: Put Karl Heinrich into play from one of your domains by paying its cost. 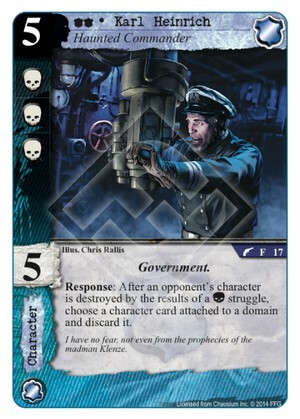 At the end of the turn, return Karl Heinrich to your hand." That would've captured the flavor of a submarine hit-and-run. He torpedoes his target from out of nowhere, then he silently disappears from the scene so you can re-deploy him next turn. It wouldn't have been over-the-top, it would've added to the card's flavor, and it would've made his cost of 5 a little more worth it by giving him a sneak attack option. And for a guy who has no fear, he can be driven insane pretty easily. A Horror Icon for a madman would have been interesting and made him more unique - but I guess that would have involved a whole bunch of rebalancing. .